MARION, Iowa, July 8, 2015—Legacy Manufacturing, an international work products company located in Marion, Iowa, received a Retailers’ Choice Award for its Flexzilla® Pro Air Hose during the National Hardware Show®, sponsored by Hardware Retailing magazine. 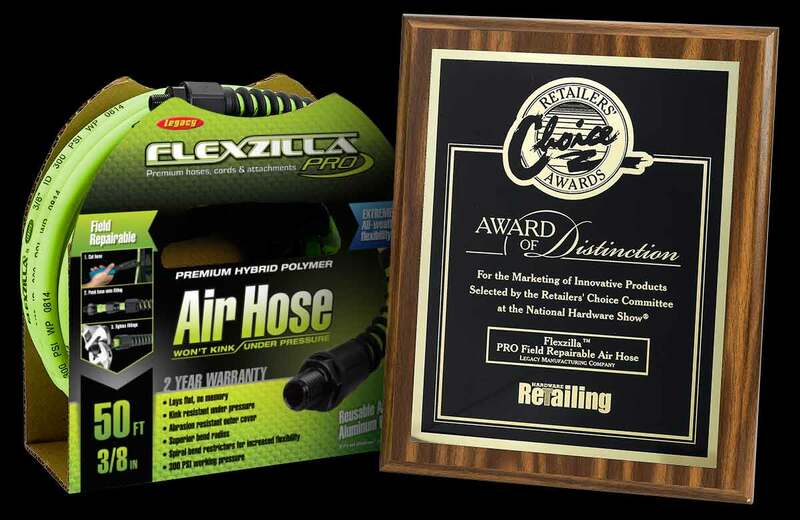 Flexzilla Pro Air Hose was one of 30 products chosen from among 5,000 to receive the award by a panel of home improvement retailers appointed by the magazine. The panelists look for unique products and packaging, and products that have strong sales potential. 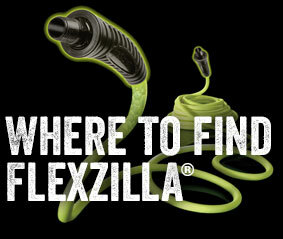 This is the second time the Flexzilla Pro line of hoses has received recognition. It was also a winner for product innovation in the 2013 Product Showcase at the Automotive Aftermarket Products Expo. “It’s an honor for our product to be recognized and appreciated as leading‐edge by customers in two different industries,” says Legacy’s VP, Matt Weems. The hose’s unique design allows for the ends of the hose to be replaced in the field if they are dysfunctional or worn. This can prevent down time on the job and save money because the hose can be repaired rather than replaced. Flexzilla Pro Air Hose can also be tailor‐made for a job. A custom length of hose can be purchased through a distributor. Legacy Manufacturing Company specializes in durable and innovative products including Legacy equipment for the automotive and industrial markets, Flexzilla hoses, cords and attachments, SmartFlex™ air, garden and RV/Marine hoses, Lock­‐n‐Load™ grease guns and ColorConnex®, an easy color matching system of couplers and plugs. Legacy Manufacturing is a division of Weems Industries, founded in 1986. For more information, visit legacymfg.com. P. Allen Smith is an award-winning designer, gardening and lifestyle expert. He is the host of two public television programs, P. Allen Smith’s Garden Home, P. Allen Smith’s Garden to Table and the syndicated 30-minute show P. Allen Smith Gardens. Flexzilla will help sponsor the annual Garden2Blog event May 12-13, 2015 in Little Rock, Arkansas. Flexzilla – the Official Garden Hose of P. Allen Smith, will showcase the Flexzilla® Garden Hose with SwivelGrip™ Connections and introduce a new line of garden hose exclusively for P. Allen Smith! The National Hardware Show is May 5-7, 2015 in Las Vegas, NV. This is THE place to be for the $343 Billion dollar US home improvement and DIY markets, attracting a worldwide audience of more than 27,000 industry professionals. Legacy will showcase new innovative products in the Hardware & Tools, Lawn, Garden & Outdoor Living, Farm & Ranch, Automotive and Industrial categories. Legacy’s product offering includes: Flexzilla hoses, cords and attachments; SmartFlex air, garden, RV/Marine hoses; Lock-n-Load grease guns; ColorConnex couplers & plugs and Cyclone blow guns. Visit Legacy at Booth #36072!